Maradhi Manni: The Best Part In Our Recent Tour...3 Days/Nights, In A Cruise Ship! The Best Part In Our Recent Tour...3 Days/Nights, In A Cruise Ship! I am writing first about our holidays in the Cruise ship first, since it was the best part in our tour! We had been to a 'Malaysia-Singapore' trip for two weeks, last month...came back on 1st May. We spent the last 3 nights on a Cruise ship, at the fag end of our holidays! I never expected to enjoy so much inside a ship in the middle of the sea...for 3 days and nights! So, my first post about the tour is this part! I had read about ships in Alistair Mclean's books, which was many years ago. He used to explain the interiors and parts of ships very well. Then, have watched the interiors in some English movies...I think I had never given much importance to remember everything clearly! This Cruise ship, Star Cruise Gemini/Superstar Gemini had a city inside it...it had everything from shops to recreations to swimming pools! I could have learnt dancing or origami or pizza making also in the ship! But I didn't! All these classes were for free. We watched a magic show by Ernesto from Italy (click the link to watch a part of the show..very interesting! )which was made colourful by the Brazilian salsa dancers! 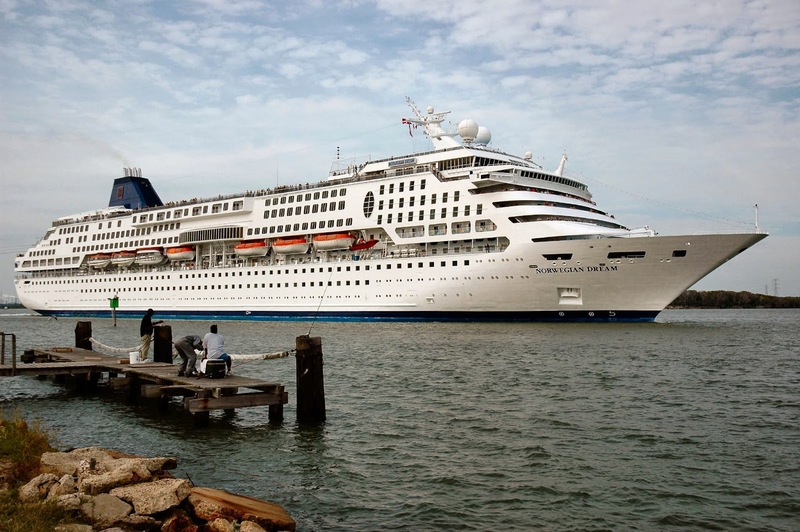 The 'Superstar Gemini' cruise ship! A city is inside this ship! We had booked for the flights to Malaysia, from there to Singapore and then to this Cruise ship, nearly 2 months earlier. The Travel agent had insisted on booking for the Cruise as early as possible, since it was difficult to get the best cabins in the cruise if it was late. Yes, we had the best view from our cabins! It was a small, but very convenient room with all the necessary amenities! You can see the window at the far end which faces the sea! I used to sit on the window sill and watch the ocean/Andaman sea, whenever I was in the room! A tiny, compact bathroom was there. A wardrobe with a safety locker, hangers etc....everything was there. The tiny bathroom...hand shower with a curtain, is on the left and wash basin and seat are on the right. But was very convenient. Everything was neat and clean. The ship has got 12 floors. First 4 floors (down) were for the ships engines, staff quarters, laundry and other things. We stayed in the 5th floor. 750 rooms are there, including some suites. 3 floors have got dining and refreshment areas. 7th floor has got reception, shops etc. Other floors on top have got casinos, gaming rooms, recreation room, health club, clinic, observatory room etc. 100% vegetarian food was available in Mariners restaurant. The best part!!! Different varieties of vegetarian food were here along with fruits, breads, cakes etc. Coffee, tea. fruits, fruit juices etc. also were available. Non-veg food was kept separately. It also tasted good, I was told. Separate dining for Chinese was available. Vegetarian food was available on the 11th floor deck, where recreation stage also was there! Dance or music was going on most of the time. They never repeated the subjis...only dosa was not there! Even idlies, upma, vada, Raw mango sweet pachchadi (!) also were there! Different types of bakery items, even egg less cake was there! Their lemon pickle was superb! Curd tasted like home-made! All of us were eating, walking around the deck, most of the time! I have got a good tan because of the sun on the deck! We were taken by bus from the Penang and Langkavi ports for sight seeing. Will write about them later. I think 4 swimming pools and two Jacuzzi were there. 2 pools were for small children. A ship staff was always standing there, keeping an eye on the small children. Dress code was there for swimmers. Men had to wear trunks and women full swimming dress. If they didn't bring them, they can purchase from their shops in the ship...one swimming trunk was Rs. 1000/-, our currency! This is the beautiful 'Tea corner'. Opposite to this, there were counters selling handbags, artificial jewellery etc. People were sitting here, chatting or playing with children and just simply reading books in the mornings and evenings! It was very hot in daytime! Still, shades were there to sit and enjoy the sea breeze. Many people were regular customers of this cruise. One family said that they came here every year along with their small children, play basket ball, swim, read, eat and go back! Yes, a small basket ball court also is here on the other side of the deck! This is the rear end of the ship! It was very nice to watch water, bending down on the rails! Front side of the ship! All parts of the ship were clean. Mast?! I took this picture when I was waiting for the sunrise. Decks were the most attractive places in the ship! Some movies were shown, a movie a day, I think. I read the name 'Gravity' which I had already watched at home. The TV had some 11 channels. One channel showed the passage of the ship 'live'. HBO, Zee (Hindi movies and serials), Fox sports, a Disney channel were there and all others were Chinese channels, I think. I noticed more than 50% passengers were Indians, rest were Chinese mostly, Koreans, Japanese, some Australians and people from other European countries. The Captain was a Finnish, some crews were from Philippines, Germany, China etc. Other staff were mostly Chinese. Everybody was polite and did their job systematically without any flaw. I think I should stop now. Will post the pictures taken from the ship, in my next post. Make it a point to go on a ship once at least in your lifetime. The experience is unique! P.S. : The first picture of the ship is from wikipedia Others were taken by me! The second part of this post is here! Thanks for the wonderful narration. We have been in 4 cruises so far. Your post feels like I wrote it. SG: I remember reading about your cruise trip and forwarding it to my son, asking him to go on this cruise. I remember a lot from that post of yours! Thank you, SG! I am humbled! Shail Mohan: You will love the atmosphere, Shail! And take hundreds of photographs of the ocean/sea! It is beautiful! Wait for my next post for the sunrise and sunset photographs in the sea! Sounds really interesting Sandhya. I have never been in a cruise ship except for a few hours in Andaman, which was good. My daughter had been in a cruise in Egypt and she too was very impressed by the trip, and keeps telling us to make a trip at least once. Glad to know you enjoyed your holiday. WOWOWOWO thos are beautiful pics and you had a gooooood time ..
now i want ot go on one tooo .. the problem i have found is that cruises are way to expensive than if u fly to a place and stay... or maybe its only here .. I need to check this out for sure..
Bhagyashree: You will enjoy, Bhagya! We cannot use mobile much. The signal comes and goes, wi fi comes and goes, so not much disturbance. Family can come closer. RAMA ANANTH: You have to experience the stay in a good cruise ship at least once in a lifetime. This ship was very good. No complaints at all... Cruise Virgo is bigger than this ship and that is also good, it seems. Make a trip! B.: We enjoyed this trip, Bikram! You will enjoy more! I have given the link. Click on the name of the ship and you can know more about the cruise. It was not vulgarly expensive! Upper middle class people often go by this cruise. wow Sandhya!.looks like a very enjoyable one...My children keep telling me to try once but I feel that i will not get vegetarian food properly.now when you have told me, I am raring to plan..
Wow! Interesting experience, Sandhya. I have never been on a cruise but have been on a ship long ago. I would love to experience something like this. Awaiting your posts and pictures. RENU: Even we never expected to get vegetarian food. We had taken some pickles, tamarind rice paste etc. with us. We thought we could mix plain rice. Bread and fruit would be there, we thought. But we had a pleasant surprise! I have put on weight and have got tan also! This is a very good experience. Don't miss it! SUSAN DEBORAH: You will definitely enjoy the experience, Susan! Appears to be really exciting Sandhya. I have never been in a vacation except for a few time in Andaman, which was excellent. My little girl had been in a vacation in The red sea and she too was very stunned at the journey, and keeps informing us to create a journey at least once. oh wow.. looks like it was a great experience. I really want to go on a cruise now :) Waiting for more posts on your Singapore-Malaysia trip. DESTINATION INFINITY: This is the first time I have seen/gone on a ship! I have gone by boat a couple of times, though! This experience was unique! Try once! PLAY SCHOOL: Please experience this tour once! You will enjoy! AVADA KEDAVRA: Please do! SG also has written about cruise trips in the US. RAHUL BHATIA: I know you were a Navy man. When I saw white uniformed officers in the cruise, I remembered you! Yes, we enjoyed this trip thoroughly! This must have been a wonderful experience. Lovely narration and lovely pics- as always! Wonderful post and perspective on the cruise... simply neat photos and i am sure that’s breathing to perceive the sea from the deck. MANJU JOGLEKAR: Yes, this was a trip to be remembered always! Thank you, Manju! JEEVAN: Thank you, Jeevan! It was nice to watch see from our cabin window as well as from the deck. Let me post them soon. HADDOCK: This is a good experience and you will love it! You are a photographer and you can take lots of pictures too! I don't seem to read your new posts now. Please write. I have always wanted to go on a ship. I think I will too, because your enthusiastic recapture of the trip is so enticing :) Great to see you have such a wonderful time. ROSE SIEBUHR: Welcome to my space, Rose! Thanks for the comment! You too can go one cruise soon. It is very good! Hi! We are planning a star cruise Gemini trip with our 14 months old baby.. My major concern is the baby food. She's a picky eater and only takes home made porridge.. Does cabin has electric kettle? Can we take a personal electric kettle on board? Do we have access to microwave? Anonymous: Normally, I don't acknowledge 'anonymous' people. Please write your name. No, the room hasn't got a kettle or microwave. But the service/staff are very good. Everything is clean and they will definitely help you. You can call them and ask them about the electric kettle. I have never been on a cruise though I have gone round a stationary Royal Carribean Ship but your post gave me the feel of having travelled in one. With your sharp eye. for detail, you have left nothing for my imagination.Thank you very much. K.PARTHASARATHI: I still remember each and every detail of our trip. Thank you, very much, Kp. You made my day!